New Arrival / Turn Key Ready! Other photos: 2001 Cruisers 50 Sedan Sport With Flybridge, 2001 Cruisers 50 Sedan Sport With Flybridge, 2001 Cruisers 50 Salon to Port, 2001 Cruisers 50 Galley to Starboard, 2001 Cruisers 50 Salon / Dining Area, 2001 Cruisers 50 Master Stateroom, 2001 Cruisers 50 VIP Stateroom, 2001 Cruisers 50 Salon Sofa, 2001 Cruisers 50 Salon Facing Aft, 2001 Cruisers 50 Galley, 2001 Cruisers 50 Full Size Frigidaire, 2001 Cruisers 50 Dining Area, 2001 Cruisers 50 Dinette Expands, 2001 Cruisers 50 Lower Helm, 2001 Cruisers 50 Lower Helm, 2001 Cruisers 50 Steps From Dining Area to Bridge, 2001 Cruisers 50 Master Stateroom, 2001 Cruisers 50 Master Stateroom Storage, 2001 Cruisers 50 Master Head, 2001 Cruisers 50 Master Shower, 2001 Cruisers 50 VIP Stateroom, 2001 Cruisers 50 VIP Stateroom Storage, 2001 Cruisers 50 VIP Head, 2001 Cruisers 50 VIP Shower, Photo 25, 2001 Cruisers 50 Flybridge, 2001 Cruisers 50 Flybridge Seating / Helm, 2001 Cruisers 50 Upper Helm, 2001 Cruisers 50 Upper Helm, 2001 Cruisers 50 Helm Seating, 2001 Cruisers 50 Flybridge Seating to Port, 2001 Cruisers 50 Fridge / Ice Maker on Bridge, 2001 Cruisers 50 Flybridge Aft, 2001 Cruisers 50 Newer Bimini, 2001 Cruisers 50 Newer Bimini, 2001 Cruisers 50 Radar / Trac Vision, 2001 Cruisers 50 Newer Trac Vision, 2001 Cruisers 50 Aft Deck and Entry to Salon, 2001 Cruisers 50 Steps From Bridge to Cockpit, 2001 Cruisers 50 Cockpit to Starboard, 2001 Cruisers 50 Entrance to Salon, 2001 Cruisers 50 Starboard Walkaround, 2001 Cruisers 50 Port Walkaround, 2001 Cruisers 50 Forward Deck / Windshield, 2001 Cruisers 50 Windshield, 2001 Cruisers 50 Bow, 2001 Cruisers 50 Aft Deck and Entry to Salon, 2001 Cruisers 50 Sedan Sport With Flybridge, 2001 Cruisers 50 Switch Board, 2001 Cruisers 50 Port Engine, 2001 Cruisers 50 Starboard Engine, 2001 Cruisers 50 Fuel Filter, 2001 Cruisers 50 Engine Room, 2001 Cruisers 50 Starboard Engine, 2001 Cruisers 50 Sedan Sport With Flybridge, 2001 Cruisers 50 Sedan Sport Dinghy. - $50,000 Spent in Upgrades in 2018! The list goes on and on, and you will find the remaining upgrades as you review the listing. 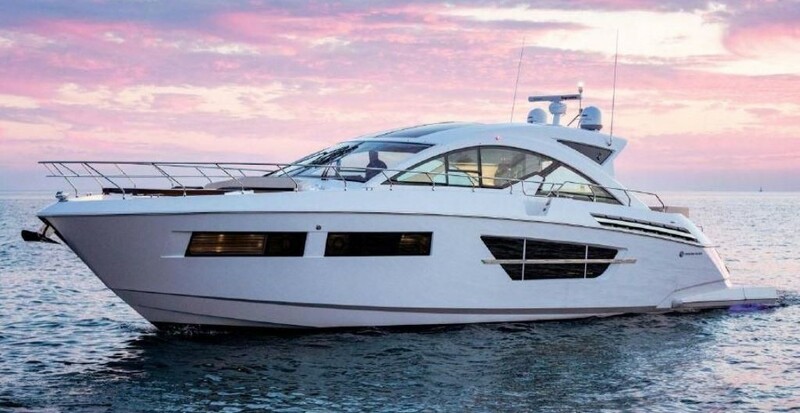 If you are searching for the ideal family cruiser, or if you plan to live aboard, be sure to get on board this Cruisers 50. She is waiting for her new owner, and she it turn key ready to go!